Loss of viability is one of the most important problems during starter culture production. Previous research has mostly focused on the production process of bacterial starters, but there are few studies about cellular protein deterioration causing cell defectiveness during storage. In the present study, we investigated the influence of storage temperature (−21, 4, 35°C) on the cellular protein modifications which may contribute to the senescence of freeze-dried Acetobacter senegalensis. Heterogeneous populations composed of culturable cells, viable but non-culturable cells (VBNC) and dead cells were generated when freeze-dried cells were kept at −21 and 4°C for 12 months whereas higher storage temperature (35°C) mainly caused death of the cells. The analysis of stored cell proteome by 2D-DiGE demonstrated a modified pattern of protein profile for cell kept at 4 and 35°C due to the formation of protein spot trains and shift of Isoelectric point (pI). 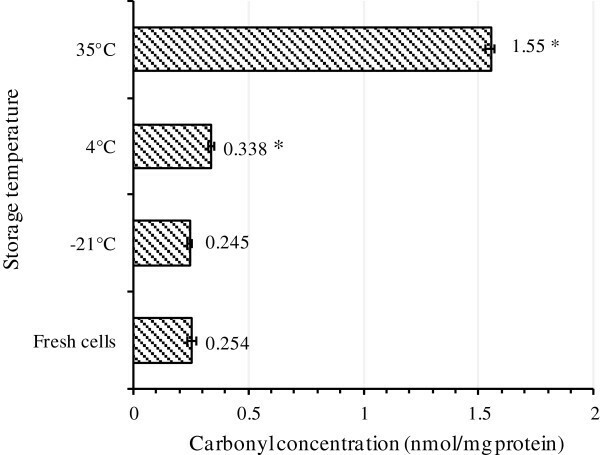 Quantification of carbonylated protein by ELISA showed that the cells stored at 4 and 35°C had higher carbonylated protein contents than fresh cells. 2D-DiGE followed by Western blotting also confirmed the carbonylation of cellular proteins involved in translation process and energy generation. The auto-fluorescent feature of cells kept at 35°C increased significantly which may be an indication of protein glycation during storage. In addition, the percentage of cellular unsaturated fatty acid and the solubility of cellular proteins decreased upon storage of cells at higher temperature suggesting that peroxidation of fatty acids and possibly protein lipidation and oxidation occurred. High storage temperature induces some deteriorative reactions such as protein oxidation, lipidation and glycation which may cause further protein modifications like pI-shift, and protein insolubility. These modifications can partly account for the changes in cell viability. It can also be deduced that even moderate carbonylation of some critical cellular proteins (like ribosomal proteins) may lead to VBNC formation or death of freeze-dried bacteria. Moreover, it seems that other mechanisms of biomolecule deterioration preceding protein carbonylation lead to VBNC formation under very low storage temperature. A starter culture may be defined as a preparation containing large numbers of viable and culturable microorganisms, which may accelerate a favorable fermentation process . Vinegar technology is one of those fermentation technologies which still suffer from the lack of cost-effective starter cultures  due to the genetic instability of acetic acid bacteria during preservation  and the susceptibility of cells to downstream processes [4, 5]. The viable cells which are used as vinegar starter must be able to tolerate acetic acid and metabolize ethanol efficiently under aggressive conditions of acetic acid fermentation . The availability of appropriate vinegar starter cultures is desirable when a new fermentation run has to be started or when it needs to be restarted due to a sudden interruption of fermentation . In recent years, Acetobacter senegalensis, a thermo-tolerant bacterium, has been used for starter production and vinegar production in a pilot plant scale acetifier [4, 7]. Use of this strain in vinegar industry can decrease the cooling cost of bioreactors especially in tropical regions. In addition, since this strain can remain viable and active in a wide range of temperature during acetous fermentation , any fluctuation of fermentation temperature can be tolerated readily. There are different industrial techniques to preserve microbial starters; however despite being an expensive and long process, freeze-drying is one of the most convenient and applicable methods compared to other drying methods . However, as with other drying methods, loss of viability is one of the main problems during freezing and drying processes as well as storage period . Intrinsic and environmental factors have considerable influence on the viability of microbial starters . Generally, the survival rate of gram-positive bacteria immediately after freeze-drying tends to be higher than that of gram-negative bacteria . In addition, pre-adaptation of cells in different culture media, usage of protectants and storage conditions affect bacterial viability significantly [5, 11]. In this context, there are evidences that damage to DNA, cell wall and cell membrane of bacterial cells under different storage conditions occur [12, 13], and it is now well accepted that membrane lipid peroxidation and change in the degree of un-saturated lipids strongly affect the survival of bacteria [7, 9, 13]. Furthermore, damage to ribosomes and their functions are speculated as the primary reasons of cell viability loss . Cellular proteins are also subjected to deteriorating reactions during downstream processes. They are very susceptible to various modifications due to the range of functional groups displayed by amino acids . Damage to proteins such as oxidation during preservation process and storage period has been studied in animal cells, plant cells, seeds as well as in therapeutic products [15–19]. Oxidative changes of cellular proteins can lead to diverse detrimental consequences in structure and function of proteins such as inhibition of enzymatic activities, polymerization, loss of solubility, increased susceptibility to aggregation and proteolysis [14, 20]. Although several protein oxidative modifications exist, most oxidized proteins exhibit carbonyl groups (aldehydes and ketones) . However, compared to other oxidative modifications, carbonylation is relatively difficult to be induced and in contrast to, for example, methionine sulfoxide and cysteine disulfide bond formation, carbonylation is an irreversible oxidative process [21, 22]. Carbonyl groups are introduced into the proteins through a variety of oxidative pathways: (I) a decline in the antioxidant defense system, (II) an increased production of reactive oxygen species (ROS), (III) a diminished capacity for removal of oxidized proteins, or (IV) an increased susceptibility of proteins to oxidative attack . In addition, carbonyl derivatives are formed by a direct metal catalyzed oxidative (MCO) attack on the amino-acid side chains of proline, arginine, lysine, and threonine. Furthermore, carbonyl derivatives on lysine, cysteine, and histidine can be formed by secondary reactions with reactive carbonyl compounds on carbohydrates, lipids, and Advanced Glycation/lipoxidation End Products (AGEs) . Advanced Glycation End products (AGEs) and AGE pigments (known also as lipofuscin) are created through non-enzymatic reactions (the Maillard reaction) between reducing sugars and free amino groups of proteins, lipids, or nucleic acids. These biomolecules contain transition metals such as iron, zinc, manganese and copper. These metals can cause a redox-active surface that can catalyze reactive releasing process . AGEs alter the structure of proteins and compromise their functions. The rate of accumulation of AGEs in proteins may be viewed as an index of the rate of damage to other biomolecules, including lipids, glycol-conjugates and DNA . A decreased enzymatic activity through oxidative reaction of proteins and Maillard reaction products has been demonstrated in plant seeds during storage [26, 27]. However, there are few studies which address the protein modifications in bacterial cells during desiccation . Despite the progress made so far in the context of bacterial starter production, to our knowledge there are only few studies on the cellular protein modifications occurring during storage of bacterial starters. The aim of this study was to investigate the influences of storage temperature on cellular viability and senescence of freeze-dried A. senegalensis. Specifically, the occurrence of modifications in protein content and properties affecting the survival of stored bacteria was studied. In this regard, three storage temperatures (−21, 4, and 35°C) were chosen and freeze-dried cells were stored for 12 months in sealed vials at the three mentioned temperatures. Then, the oxidative damage and its subsequent effects on some cellular protein properties were analyzed. In addition, the consequence of protein oxidation on some other cellular features such as AGEs formation or cell respiration was studied. Prolonged stability of freeze-dried starters is crucial for fermentation industry. Studies from our laboratory and others have shown that culturability and the viability of freeze-dried starters are dependent upon freeze-drying process as well as storage conditions [4, 9, 11, 13, 28–30]. We have also previously shown that storage temperature affect the viability and culturability of freeze-dried starter, and that even at low storage temperature (−21, 4°C), cells enter into VBNC state . Culturability of cells was determined merely after freeze-drying (as control) and also after 12 months of storage at different temperatures. Cell culturability was affected considerably by storage temperature. As shown in Table 1, while the change in culturability at −21°C was limited, it decreased significantly at 4°C in comparison to −21°C. Additionally, the culturability of cells disappeared at 35°C. It is now well accepted that for long term storage, inactivation of the dried starter cultures extensively depends on the storage conditions . Since the vials containing the freeze-dried samples were completely sealed, the moisture content did not change significantly (Table 1). In addition, they were kept in the dark, and originated from the same fermentation and freeze-drying batches; thus we can assume that the only affecting factor was storage temperature. 1Values are presented as mean ± SD. Measurement of total dehydrogenase activity (indicative of cell respiration) revealed that nearly all of the cell population (95%) kept at −21°C for 12 months was able to reduce CTC in the presence of glucose-phosphate buffer (Figure 1A). The small percentage of cells which were not able to reduce CTC were presumably dead cells or cells that could not be active under mentioned conditions. Flow-cytometric analysis of cellular dehydrogenases of freeze-dried A. senegalensis cells stored at −21°C (A), 4°C (B) and 35°C (C) for 12 months. Thiazole orange (TO) was used to stain all the cells (viable and non-viable cells). CTC is reduced by active cellular dehydrogenases, and the emitted light is absorbed on FL3. The activity of dehydrogenases which determined by CTC reduction was considered as a sign of viability. Storing of freeze-dried cells at 4°C for 12 months resulted in a heterogeneous population of bacteria according to CTC reduction ability (Figure 1B). This may indicate that some cellular enzymes involved in respiration system such as dehydrogenases were subjected to detrimental conditions which disabled the respiration system. However, about 23% of cells were able to carry out that reaction completely, resulting in high absorbance on FL3. It has been already shown that dehydrogenases are especially heat sensitive . In our previous study, it was shown that storage of freeze-dried A. senegalensis at 4°C for nine months did not change the cell envelope integrity considerably , therefore the changes in dehydrogenase activity during storage at 4°C may not be due to the leakage of cellular components or entrance of liquids into the cells. In contrast, it could be due to direct inactivation of enzymes. At 35°C, 85% of cells lost the capability of reducing CTC (Figure 1C). These cells can be considered as dead cells or cells needing some complementary components to perform respiration. Furthermore, our results indicate that although low temperature could decrease the proportion of non-viability and non-culturability, a fraction of cells entered into VBNC state at very low storage temperatures (i.e., -21°C) as indicated by summarizing the data in Figure 2. These results are in line with research showing that VBNC formation is also induced during preservation [32, 33]. One possible explanation for entry of bacterial cells into VBNC state during storage period is irreparable damage to key structural or functional components (such as ribosomes and DNA) of cells which are completely necessary for multiplication [11, 34, 35]. The influence of storage temperature on VBNC formation in freeze-dried A. senegalensis cells after 12 months of storage. Experiments were performed at least in three independent replicates. Error bar shows the standard deviation. One of the primary diagnostic criteria for development of a browning reaction in a product is the development of dark color in product. As shown in Figure 3, a browning reaction occurred in cells kept at 35°C that darkened after storage for 12 months, whereas the cells stored at lower temperature showed no visible change in color. Non-enzymatic browning may result from Maillard and Amadori reactions starting from a condensation reaction between reducing sugars and amino groups. These reactions are known to produce carbonyl intermediates which react with neighboring amino groups . Protein glycation is a process in which reducing sugars interact with primary amines on the side chains of Lysine and Arginine, resulting in a chemical sequence of reactions known as “Amadori rearrangement” which leads to the formation of Amadori modified proteins (AMPs). AMPs can be further developed, in an oxidation-dependent manner, to form irreversible, highly stable compounds known as Advanced Glycation End-products (AGEs) . The appearance of freeze-dried A. senegalensis kept at different storage temperatures for 12 months. 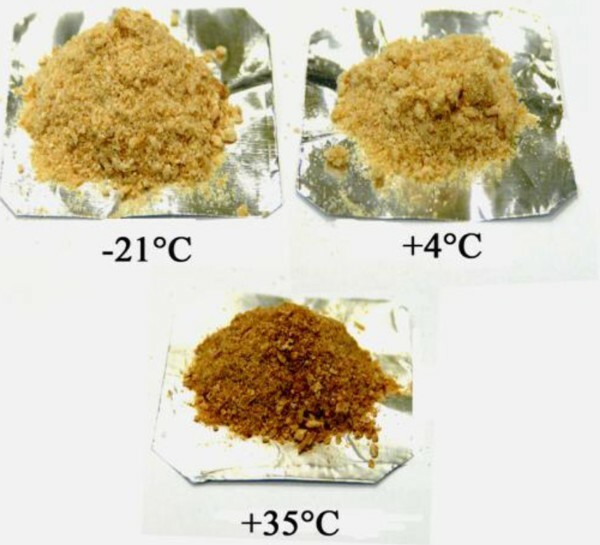 The color of freeze-dried cells preserved at 35°C changed to dark brown while the color of freeze-dried cells preserved at −21 and 4°C did not change. In order to assess the development of AGEs in cells kept at different storage temperatures, the autofluorescent feature of cells were assessed by flow-cytometric technique. 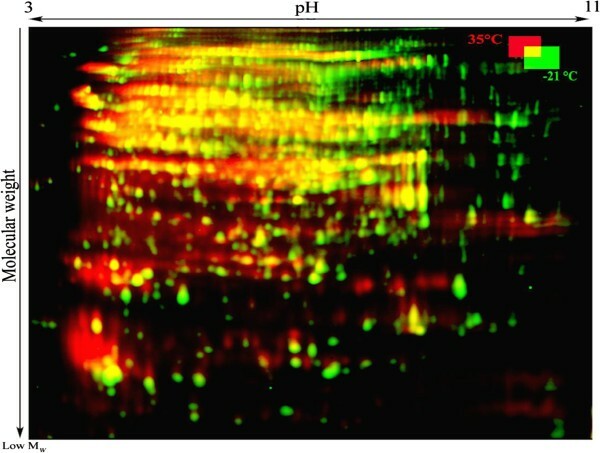 As Figure 4 shows, illumination of cells with blue laser light (488 nm), induced light emission which appeared on FL3. Since the Kolmogorov–Smirnov test showed that the signal intensity followed a normal distribution, Duncan’s multiple range test was used to compare the mean of the three populations. A significant difference in mean and median light intensity was observed between the cells kept at 35°C and −21°C or 4°C. However, there is no significant difference in light intensity between the cells kept at 4 and −21°C. Statistical analysis revealed that about 42% of cells kept at −21 and 4°C had overlap whereas there is no significant overlap between the cells kept at 35°C with the cells kept at lower storage temperature. Auto fluorescence feature of freeze-dried A. senegalensis kept at different storage temperatures for 12 months. Light emitted from cells was collected and appeared on FL3. A significant difference (p < 0.05) was observed between the light intensity mean of cells kept at 35°C and the light intensity mean of cells stored at −21 or 4°C. Recently, the evaluation of fluorescent compounds generated by the Amadori rearrangement product has become a routine practice. Besides its use in food quality control, fluorescence measurement is also employed to evaluate Maillard reactions causing AGEs generation under physiological conditions, and also to assess AGEs development under pathological conditions . The results obtained in this study are in agreements with those of Kurtmann and coworkers. They showed that browning of freeze-dried Lactobacillus acidophilus during storage under relatively mild conditions resulted in various types of non-enzymatic browning reactions including carbonyl-protein (or carbonyl-DNA) interactions and carbohydrate condensation/polymerization . Furthermore, in our study, since the cells were not washed prior to freeze-drying (to avoid possible damage to the cells by low osmotic buffers) [4, 5], residual reducing sugar (glucose) and proteins or even DNA or RNA released by cell lysis during fermentation or freeze-drying can enhance the non-enzymatic browning reactions . It is believed that formulation strategies during freeze-drying process have great influence on the stability and viability of bacteria. Addition of compounds containing carbonyl groups has been suggested to be a cause of mortality occurring during storage of dried microorganisms . Form these results, it can be deduced that some temperature-dependent reactions induce the formation of fluorescent compounds in the stored cells. These fluorescent compounds can be a sign of protein glycation. To study the molecular mechanisms associated with the loss of viability and culturability during storage, a differential proteomic analysis approach was used. First, we determined the distribution pattern of the cellular proteome by two-dimensional difference gel electrophoresis (2D-DiGE) for cell kept at different temperatures. In the second part, the extent of protein carbonylation was studied using ELISA test and 2D-DiGE followed by immunoblotting (Western blotting). 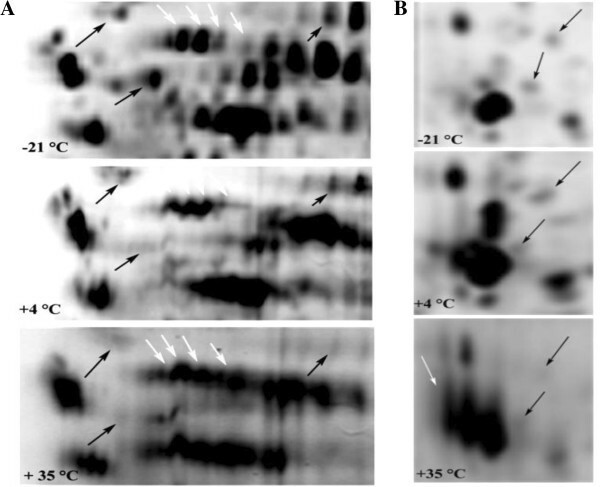 The electrophoretic patterns of cellular proteins revealed major changes in protein profile of freeze-dried A. senegalensis kept at different storage temperatures (Figure 5). Triplicate samples of cells stored at each temperature were run on different gels, and representative gels are exhibited in Figures 5 and 6. The pattern of obtained spots was reproducible for each condition and includes many proteins appearing as single spots (for the cells kept at −21 and 4°C); however the majority of proteins appeared as trains of spots (white rectangles in Figure 5) or vertical streaks (the black rectangles in Figure 5) for samples kept at 35°C. These changed patterns made it difficult to distinguish unambiguously each protein from neighboring proteins. Different reasons can possibly explain the appearance of streaking in 2D-DiGE: inadequate isoelectric focusing and/or (bio) chemical modification of proteins. Contamination with salts, DNA, polysaccharides and lipids during preparation of protein samples can be a cause of streaking. Since the same standard procedure was applied to all the samples using high grade reagents, it seems that streaking cannot arise from the sample preparation procedures. In contrast, it may result from modifications of cellular proteins during storage at 35°C. Heterogeneous modifications such as lipidation (the covalent binding of a lipid group to a peptide chain), glycosylation and glycation can induce streaking in proteins pattern during bi-dimensional electrophoresis. As explained in the previous section, the development of fluorescent compounds in stored cells is already a sign of glycation. 2D-DiGE of A. senegalensis preserved at −21 (left), 4 (middle) and 35°C (right). The proteins were pre-stained with Cy3 before separation. As it is evident, slight and moderate streaking and trains of spots were formed in the proteome pattern of cells kept at 4 and 35°C. The density of high molecular weight proteins at the basic side of the gel decreased at 35°C. The selected sections (white and black rectangles) show clearly the differences between the patterns of proteins. Comparison of selected 2D-profiles of proteins extracted from cells stored at different temperatures. A and B are the magnified sections (white and black rectangles) in Figure 5, respectively. The black arrows show the protein spots which exhibited a decrease in density during storage at 4 or 35°C. The white arrows show the intact protein spots (−21°C) and the trains of protein spots formed during storage at 4 or 35°C. Using 2D-DiGE, it was possible to detect changes in molecular weight and shift in Isoelectric point (pI) of cellular proteins. Visual assessment of the 2D protein patterns revealed significant changes that appeared as red or green spots (Figure 7). To quantify changes in protein abundance and position, measurement of all fluorescence-labeled proteins spots was conducted with the Decyder software. Two kinds of modifications were observed during storage at 35°C: a change in the abundance of proteins and a slight or considerable shift toward acidic pI. However, as already mentioned the determination of exact change in abundance of proteins during storage was not feasible due to the extensive formation of spot trains and streaking. Comparison between the proteome of freeze-dried A. senegalensis preserved at −21 and 35°C for 12 months. The green and red spots indicate CyDye-labelled proteins from the cells kept at −21 and 35°C, respectively. Trains of red spots are mostly observed in the protein profile of cells stored at 35°C. Table 2 lists three proteins with considerable shifts of pI for the cells stored at 35°C. They were found on the acidic side of the gel (pH 4.5-5) although their identification by MALDI-TOF-MS/MS showed that they are ribosomal proteins with theoretical pI between 10.5-11.5. Thus significant modifications occurred causing the displacement of proteins from basic to acidic side of the gel. Modifications that may cause protein pI-shift include protein truncation, acetylation, phosphorylation, or glycosylation (or glycation) . Among these modifications, glycation is more likely to happen since: first the molecular weights did not change excluding a significant truncation of these proteins, second upon phosphorylation, proteins with basic pI to shift only moderately to acidic pI , and finally the identification by MALDI-TOF-MS/MS did not reveal any acetylation. Oxidation of side chains of proline, of Proline, Arginine, Lysine and Threonine leads to production of carbonyl groups (aldehyde and ketones) . Since carbonyl groups are chemically stable, they can be used as biomarkers for detection of protein oxidation . In addition, multiple oxidative agents such as ROS or indirect reactions caused by secondary by-products of oxidative stress can lead to production of carbonyl groups [21, 43–45], however one of the disadvantage of protein carbonyl as biomarker is that they are nonspecific oxidation markers . It is also noticeable that Methionine (Met) and Cysteine (Cys) are the amino acids most prone to oxidative attacks, and oxidation of other amino acids requires more stringent conditions . Thus, it can be assumed that disulfide bonds and Met sulphoxide residues are formed before or simultaneously with the formation of carbonyl groups in proteins . Total content of carbonylated proteins was quantified by an ELISA method. As Figure 8 shows, the total amount of carbonylated proteins increased dramatically in freeze-dried cells kept at 35°C whereas the cells before freeze-drying (fresh cells) or the cells kept at −21°C did not show any significant difference in the content of carbonylated proteins. For the cells kept at 4°C, the amount of carbonylated proteins was moderately higher than the cells before freeze-drying. Quantification of total cellular carbonylated proteins by ELISA test. The amount of carbonylated proteins increased with storage temperature. For each kind of cell, at least three independent extractions were performed and carbonylated proteins were quantified in triplicates. Error bar represents the standard deviation. 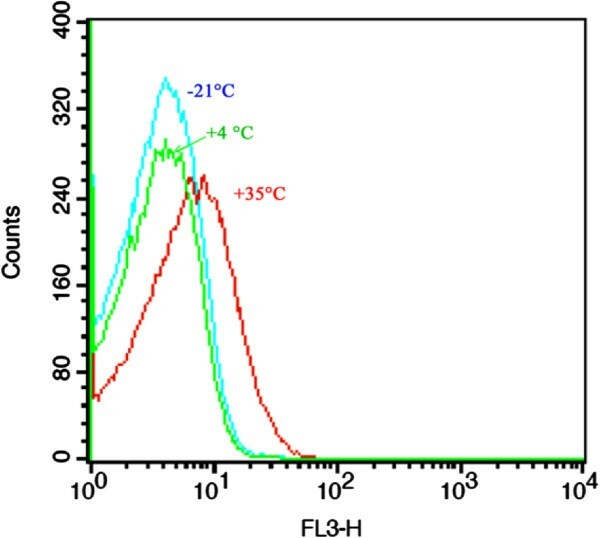 The asterisk shows significant difference (p < 0.05) between the carbonylated protein content of fresh cells and the carbonylated protein content of the cells kept at different temperature. To determine the effect of storage temperature on the extent of carbonylation of cellular proteins, 2D-DiGE followed by Western blotting was used. Immunoblotting of 2, 4-dinitrophenyl hydrazine (DNPH)-derivatized proteins revealed that various proteins were slightly or heavily carbonylated in cells. Without DNPH derivatization, no spot was detected indicating that the proteins did not react with anti-DNP antibody. In addition, Cy3 and Cy5 dyes used for detection of sample proteins and internal standard proteins respectively, did not emit light when illuminated with 488 nm laser, thus there was no interference between total protein staining and antibody staining in the immunoblot procedure (Figure 9). Protein carbonyl patterns of freeze-dried A. senegalensis kept at 35°C for 12 months. Total proteins were stained with Cy3 (green) and were separated by 2D-DiGE. Following transfer to PVDF membrane, the carbonyl groups in proteins were analyzed by immune-detection using a Cy2-coupled assay (blue). As shown in Figures 9 and 10, most of the high molecular weight proteins were carbonylated regardless of their pI whereas carbonylation process did not affect low molecular weight proteins or very basic ones. Identification of carbonylated proteins of freeze-dried A. senegalensis stored at 35°C after separation by 2D-electrophoresis. A preparative gel and a western blot gel containing the same sample were run in parallel. 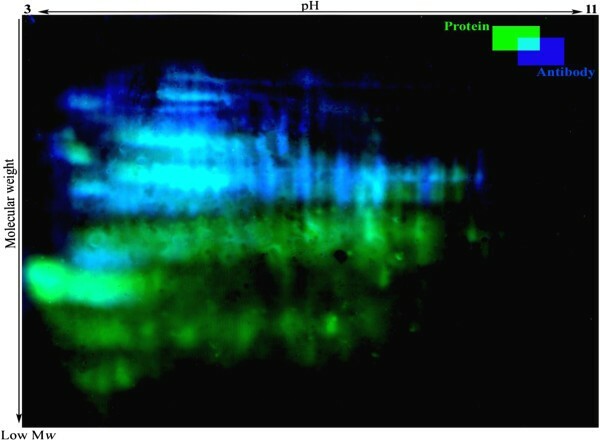 Anti-DNP antibody staining was realized on the WB to localizethe carbonylated proteins spots that were then reported on the preparative gel image, as indicated by the blue spots. Eighty-eight proteins which underwent carbonylation were then picked from the preparative gel and analyzed by mass spectroscopy. Thirteen different proteins were identified as indicated on the gel image, of which 10 are carbonylated proteins with modifications in Arginine, Lysine, Proline and Threonine as listed on Table 2. By comparing the results of ELISA and western blotting, it was found that the results of Western blotting for samples kept at −21 and 35°C are in accordance with the results of ELISA test. In contrast, a contradiction was observed for cells stored at 4°C. As already explained, a moderate increase in the amount of carbonylated proteins was observed by ELISA method for these cells, however no carbonylated protein were detected using 2D-DiGE followed by western blotting. It is believed that the latter method has significantly more sensitivity and specificity than all other total carbonyl assays such as spectrophotometric DNPH assay and ELISA method . It should however be noted that there is a detection limit for oxidized proteins by immune-blotting methods, and oxidized proteins in low quantity cannot be detected easily . Therefore, it can be assumed that some proteins may undergo very slight carbonylation which is not detectable by these methods. In addition, as already discussed, some other protein oxidation reactions may occur prior to carbonylation which may cause VBNC formation in cells. In order to identify the proteins that were oxidized when cells were kept at 35°C, 88 protein spots were selected and picked from preparative gel maps that had been matched to the 2-4-DNP-derivatized protein spots maps and subjected to identification by MSMS analysis. Proteins were identified in only 13 of the 88 selected spots from Figure 10 of which 10 contained carbonylated amino acids (Table 2). This low number technically results from the limited coverage of sequence (generally between 15 and 50%) that was achieved allowing only a small number of peptides to be analyzed. Thus, the lack of detection of carbonylated residues by MSMS analysis does not necessarily means that the identified proteins were not carbonylated. Lysine, Arginine, Threonine and Proline were identified as target amino acids where carbonylation occurred. Both structural proteins and enzymes were found among the carbonylated proteins. Our results are considerably consistent with the studies showing the susceptibility of cell envelope protein and translational proteins to oxidative stress [47–50]. It has already been shown that exposure of E. coli to different stress conditions such as H2O2, iron overloading or super oxide generating compounds causes carbonylation of Elongation factor G (EF-G), outer membrane protein A (ompA), β-subunit of F0F1- ATPase, heat shock proteins and enolase. In addition, following such oxidative stress, the viability was affected to different extents depending on the type of exerted stress . One group of carbonylated proteins identified in this study indeed belongs to the cell translation machine (Figure 10 and Table 2). SSU ribosomal protein S1 presumed function is to participate in the initiation of translation, possibly by binding mRNA and directing it to the ribosome . There are also evidences that heat stress causes important irreversible reactions in the cell ribosomes; however more experimental evidence is still needed to determine whether or not ribosome is the critical component responsible for the thermal death of microorganisms [11, 52, 53]. Thus, the obtained results can be used as an indication and also confirmation that during cell death at high storage temperature, ribosomal proteins are oxidized. Other proteins involved in translation process which were also carbonylated during storage of cells at 35°C are Elongation factor G (EF-G) and Elongation factor TU (EF-TU). In the protein synthesis process by ribosome, loading of tRNA into the A site of 50S subunit is assisted by the elongation factor EF-Tu. Elongation factor G (EF-G) is involved in translocation of the tRNA holding the polypeptide . Recently, it has been shown that the latter protein is very susceptible to oxidation during oxidative stress in E. coli. Under in vitro conditions, treatment of EF-G with H2O2 resulted in a complete loss of activity due to oxidation of cysteine residues . In our previous study on storage of freeze-dried A. senegalensis, we have shown that cell envelope integrity was subjected to changes during freeze-drying process and storage at 35°C . Those findings are consistent with the observations of the present study and some other studies stating that essential targets on which survival depends during ROS stress include membrane lipid integrity and ROS-susceptible proteins, including proteins required for faithful translation of mRNA . Another group of oxidized proteins identified in this study is involved in cell energy generation. The α and β subunits of F1 ATP synthase were detected as heavily carbonylated proteins (Table 2). ATPases consist of two components, a multiprotein cytoplasmic complex called F1 that carries out the chemical function (ATP synthesis), connected to a membrane-integrated component called F0 that carries out the ion-translocating function . As already mentioned, the respiration system of cells kept at 4 and 35°C was affected during storage (Figure 1). In addition, in our previous study on stored freeze-dried A. senegalensis, we observed that cellular respiration was impaired during storage at high temperature , thus the results of the present study suggest that respiration disability of these cells may be due to defective ATP synthase involved in respiration chain. In our previous study on storage of freeze-dried A. senegalensis, we have also shown that the cell envelope integrity was subjected to changes during freeze-drying process and storage at 35°C . Those findings are consistent with the observations of the present study and some other studies stating essential targets on which survival depends during ROS stress include membrane lipid integrity and ROS-susceptible proteins, including proteins required for faithful translation of mRNA . According to the obtained results from the ELISA test and immunoblotting, with regard to the results of viability and culturability (Figure 2), it can be inferred that carbonylation of proteins is not the main reason for the entrance of bacteria to VBNC at low storage temperature. Thus, it can be assumed that other deleterious reactions preceding carbonylation can lead to the death or VBNC formation at low temperatures. We found that solubility of cellular proteins decreases at high storage temperature (35°C). Total cellular proteins of stored cells were extracted using different solutions (low salt (LS), High Salt (HS), Ethanol, NaOH) and the amount of proteins in each fraction was determined by the Bradford method. As shown on Table 3, the amount of released proteins (RP) from cells kept at various temperatures after washing in phosphate buffer (KPB) did not show significant differences (p > 0.05, range 0.99), indicating that the discharge of proteins from damaged cells did not occur after storage. However, the amount of total soluble proteins which remained in the supernatant after ultra-sonication in low salt fraction (LS) decreased as the storage temperature increased. In other words, higher storage temperature caused protein insolubility. Storage of cells at lower temperature (−20, +4°C) for long time (12 months) did not cause protein insolubility in LS and NaOH fraction (p > 0.05, range 0.62) whereas storage at 35°C resulted in lower concentration of soluble proteins in LS and NaOH solutions (p < 0.05, range 0.004). A comparison between the cells kept at −21°C and 35°C shows that preservation of cells at 35°C caused about 21.3% insoluble proteins in LS fraction. As the moisture content of freeze-dried cells was constant during storage, it seems that the change in protein solubility was mainly related to the storage temperature. KPB: 50 mM potassium phosphate buffer solution, pH 6.8; LS: low salt buffer; HS: high salt buffer. Ethanol 70% (v/v) and NaOH 0.1 M. Data are presented as mean ± SD. One direct consequence of oxidative damage (such as carbonylation) to proteins is a change in protein solubility. High molecular-weight aggregates are formed when proteins are heavily carbonylated whereas the proteasomal system only moderately degrades carbonylated proteins . Since carbonylation of proteins is an irreversible and irreparable oxidative damage [57, 58], the generated aggregates accumulate as damaged or unfolded proteins . An important question is whether protein insolubility which is observed in many aging processes (as well as in the present study) is also responsible for the death of bacterial cells into VBNC state. Whatever the causal relationship between protein oxidation and temperature, oxidative stress has been recognized to play a major role in cell viability by direct or indirect protein modifications . Maisonneuve and coworkers have shown the presence of aggregated proteins in aerobically growing healthy E. coli. As the level of aggregation was correlated with the amount of ROS produced during growth, they finally concluded that aggregates may function as temporary trash organelles for detoxifications . In addition, it has been shown that protein aggregates increase during population senescence of E. coli, and reach a maximum in stationary phase. The amount of protein aggregates is proportional to the ratio of dead cells . Cao and et al. showed that viability of invading bacteria to plant cells was reduced through oxidation of special membrane transporters . It was also shown that E. coli VBNC state during stationary phase is preceded by damage to proteins such as carbonylation of proteins which affects various bacterial compartments and proteins . According to these results and in general agreements with earlier studies, it can be assumed that insolubility of proteins which can be one of the consequence of protein carbonylation increases during senescence of bacterial population in storage period, and thus can be considered as a cause of death. As already discussed, the proteome of cells kept at 35°C showed trains of spots or streaking (Figures 5 and 6). In the present study, the fatty acid content of fresh and freeze-dried cells was analyzed using gas chromatography method. As Figure 11 shows, Palmitoleic acid (C16:1) and Oleic acid (C18:1n9c) were detected as the main unsaturated fatty acids in fresh cells before drying. Oleic acid (C18:1n9c) was the predominant fatty acid identified by this method. After storage of the cells at different temperatures, the fatty acid profile was subjected to changes, and the unsaturated fatty acid content of cells kept at 35°C decreased considerably (p < 0.05, range 0.002). In contrast, the percentage of some saturated fatty acids increased significantly (p < 0.05, range 0.001) in the cells kept at 35°C. Fatty acid content of freeze-dried A. senegalensis cells stored at different temperatures for 12 months. The ratio of unsaturated fatty acid to total extracted fatty acid decreased during storage at high temperature. Error bar shows the standard deviation. Asterisk shows the significant difference (p < 0.05) between the content of fatty acid for fresh cells and stored cells. 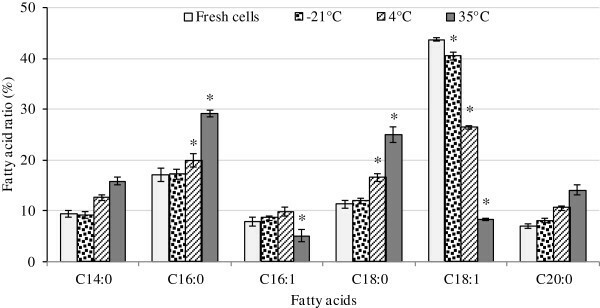 The same trend of fatty acid change was observed for cells kept at lower storage temperature; but, the extent of change was temperature dependent. The percentage of oleic acid moderately decreased during storage at 4°C (p < 0.05) and was even less reduced at −21°C (p < 0.05, range 0.004). Change of fatty acid ratio (unsaturated/saturated) of different lipid products during storage conditions have been reported by many authors [11, 30, 63–65]. It is well-known that the loss of bacterial viability during storage is increased following lipid oxidation [11, 49]. α, β-unsaturated alkenals such as 4-hydroxynonenal produced during the peroxidation of polyunsaturated fatty acids have been shown to react with proteins  and to form stable covalent thiolether adducts carrying a carbonyl function . Considering the storage condition of our samples (normal atmosphere, low and high temperature) and the intrinsic factors in the formulation (presence of glucose, and spent growth culture media), several sources of ROS formation might exist. Formation of ROS during freeze-drying process and storage of freeze-dried products has indeed been reported [34, 35]. At low moisture content, non-enzymatic reactions are known to occur, such as Amadori and Maillard reactions , as well as lipid peroxidation [34, 66]. Enzymatic oxidation of lipids through lipoxygenase is also possible in low water activity (about 0.4) . Indeed, it is widely accepted that presence of lipid moiety, specially unsaturated lipids may enhance free radical-mediated oxidative damage [34, 67] it has also been shown that presence of lipids in freeze-drying formulation can enhance the ROS formation during storage . This work demonstrated that the protein content of freeze-dried A. senegalensis is subjected to different changes during storage period. In addition, storage temperature affects the total cellular proteome significantly. Although many studies attempted to improve viability in bacterial starter, modifications of bacterial cellular proteins during storage of freeze-dried starter have not been considered in details. An association between storage temperature and protein carbonylation was established in our study. Moreover, we showed that samples mainly composed of dead cells contained higher amount of carbonylated proteins including some critical proteins such as ribosomal proteins or proteins involved in energy generation. Moreover, since protein carbonylation is a reaction which normally occur after other oxidative reactions, it seems that some other reactions (such as lipid peroxidation or protein lipidation and glycation) happen prior or in parallel to carbonylation. These reactions may be involved in VBNC formation even at very low storage temperature. Formation of fluorescent substances in the stored cells, the changed pattern of 2D-DiGE and the modifications in composition of cellular fatty acids can be considered as indications of Maillard reaction progression, AGEs formation and protein lipidation. Therefore, from a practical point of view, it is first suggested to decrease the residues of spent growth medium and the metals content in the freeze-drying formula (e.g. by washing cells with appropriate buffers before freezing process to eliminate the fermentation supernatant). Secondly, because a part of the cells already has been entered into VBNC state during drying process, it seems that the deterioration reactions were first initiated during freeze-drying process and enhanced during storage. Accordingly, to diminish the deterioration reactions during storage period, any process that may causes bacterial injuries during fermentation and freeze-drying process must be avoided. Finally, since the deterioration reactions are considerably temperature dependent it is recommended to keep the freeze-dried bacteria at low temperature. A. senegalensis CWBI-B418T (=LMG 23690 T = DSM 18889 T), a thermo-tolerant acetic acid bacterium, isolated from mango fruit in Walloon Center of Industrial biology (CWBI), was used through this study . A. senegalensis was grown in a 15 L laboratory-scale bioreactor (Bio Biolaffite, France) containing glucose (20 g/l), yeast extract (7.5 g/l), MgSO4.7 H2O (1 g/l), and (NH4)2HPO4 (1 g/l), K2HPO4 (1 g/l). The fermentation was performed under conditions previously described . Production of freeze-dried starter culture was performed as previously described  except that the cells were not mixed with mannitol. Instead, the cells were mixed with culture supernatant to reach the right dry weight. Freeze-dried cells were crushed and then dispensed into glass vials. The vials were sealed with septum and caps. They were then kept at three different temperature (−21, 4 and 35°C) up to 12 months in the dark. Total cell number of fresh cells and rehydrated cells was determined by using Brucker slides (Lo-Laboroptic Ltd, Lancing, UK). Briefly, 100 mg of freeze-dried cells were resuspended in 10 ml of GY medium. After 5 min of incubation at 30°C, it was mixed vigorously. The number of cells was then counted by using phase contrast microscope (Olympus, Tokyo, Japan). Culturable cells in freeze-dried samples were determined by using spread plate technique. GY medium was used as the medium for enumeration of culturable cells. GY agar medium contained: glucose 20 g/l, yeast extract 7.5 g/l, MgSO4.7 H2O 1 g/l, and (NH4)2HPO4 1 g/l, KH2PO4 1 g/l, agar 15 g/l. pH of medium was set at 6.0 ± 0.05. GY broth (the same components as GY agar) were used as rehydration medium and diluting medium as well. 5-cyano-2,3-ditolyl tetrazolium chloride (CTC) (λex 450 nm; λem 630 nm) and thiazole orange (TO) (λ ex 509 nm; λ em 530 nm) were used to determine the total dehydrogenase activity. CTC is a redox dye which is converted to a solid formazan dye by cellular respiratory chain. Solid formazan emits red fluorescence. A stock solution of 50 mM CTC in filtrated deionized water, and a stock solution of 42 μmol/L TO in DMSO were prepared. The TO solution was diluted 10 times in DMSO just before staining of cells [4, 5]. All experiments were performed using a BD FACSCalibur™ flow cytometer (Becton, Dickinson, USA) equipped with an air-cooled argon laser and a red diode laser. Data were analyzed using BD CellQuest™ Pro software (Becton, Dickinson, USA). Instrument settings and staining procedure were performed as already described . Briefly, freeze-dried A. senegalensis were rehydrated and harvested by centrifugation, and the pellets were washed twice with saline phosphate buffer solution containing 18 mM glucose (PBSG). 45 μl of CTC solution was mixed with 450 μl of cell suspension and incubated at 30°C for 90 min on shaker (130 rpm) in the dark, then 5 μl of diluted TO was added to each sample and incubation was continued for 5 min at 30°C in the dark before passing the samples to FACS Cytometry. Auto-fluorescence of cells was detected according to the procedure explained by Sheehy . Briefly, freeze-dried cells were suspended in PBS (100 mM, pH 7.4) for 10 min and washed three times to remove extracellular components. Then, the cell suspensions were delivered to BD FACSCalibur™ flow cytometer (Becton, Dickinson, USA) at low flow rate, corresponding to 500–700 events/s (in the Forward Scatter vs. Side Scatter plot). The autofluorescence signal was collected on FL3. For each cell population, three independent samples were prepared and introduced to the FACS. The total counted events for each sample were set on 55000. 30 mg of freeze-dried cells were suspended in 10 ml of 50 mM phosphate buffer (pH 6.8), mixed vigorously and incubated at 25°C for 10 min, and then the cells were washed with the phosphate buffer solution twice. Washed cells were re-suspended in 1 ml of 50 mM Tris–HCl, 200 mM NaCl buffer (pH 8.3) and sonicated (50% power, 5 cycles) for 135 seconds on ice. Afterwards, the sequential extraction was performed in protein free Eppendorf® tubes as follows: 50 mM Tris–HCl, 200 mM NaCl buffer (pH 8.3) (Low Salt, LS) for 20 min on ice (twice); 50 mM Tris– HCl, 1 M NaCl buffer (pH 8.3) (High Salt, HS) for 20 min on ice; 70% (v/v) ethanol for 30 min at 65°C (E); and 0.1 M NaOH solution for 30 min on ice. At each extraction stage, 0.6 μl of protease inhibitor cocktail for general use (Sigma-Aldrich) was added to the solutions. Supernatants were obtained after 10 min centrifugation (14,000 g and 4°C), and then the amount of soluble protein in each fraction was determined by Bradford method. 2D-DIGE proteomic analysis has been performed on freeze-dried cells kept at different temperatures for 12 months according to the procedures already used and published by Wislet-Gendebien et al. . Proteins were extracted in a lysis buffer containing 7 M urea (GE Healthcare, Diegem, Belgium), 2 M thio-urea (GE Healthcare), 30 mM Tris (pH 8.5) (GE Healthcare) and 2% ASB14 (Sigma-Aldrich). The supernatant containing the extracted solubilized proteins was precipitated (2-D Clean- Up Kit; GE Healthcare) and proteins resolubilized in lysis buffer were quantified using RC-DC Protein Assay (Bio-Rad). Each 25 μg of sample proteins was labeled with 200 pmol CyDye (GE Healthcare), either Cy3 or Cy5, and left for 30 min in the dark. The labeling reaction was stopped by adding 10 mM lysine for 10 min at 4°C. An internal standard was prepared by mixing equal quantities of all the experimental samples and was labeled with Cy2. Then, all the samples within the experiment were mixed in pairs together with 25 μg of the labeled internal standard and were separated by isoelectric focusing using pH 3–11 (24 cm) IPG strips in an Ettan IPGphor focusing system (GE Healthcare) in the first dimension. Before initiating the second dimension step, proteins in IPG strips were reduced for 15 min in an equilibration buffer (50 mM Tris–HCl (pH 8.8), 6 M urea, 30% glycerol, 2% SDS) containing 1% DTT and then they were alkylated in the same equilibration buffer containing 5% iodoacetamide. IPG strips were placed on top of classical 12.5% SDS-PAGE gels and the electrophoretic migration was completed in an Ettan Dalt apparatus (GE Healthcare) at 2 W/gel for 30 min, and then 25 W for 18 h. After scanning the gels with a Typhoon 9400 Laser Scanner (GE Healthcare) at three different wavelengths corresponding to the different CyDyes, 2-D gel analysis software (DeCyder version 7.0; GE Healthcare) was used for spot detection, spot quantification relative to the corresponding spot in the internal standard and gel matching. 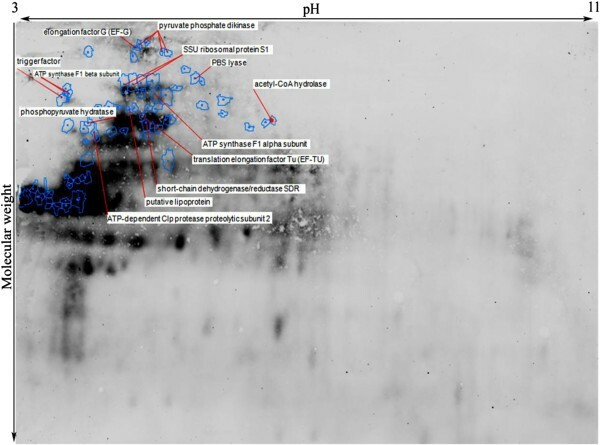 Protein spots that showed a significant variation in their abundance of at least twofold (Student’s t test, p < 0.05) between storage conditions were selected for further identification and were automatically picked from preparative gels run in parallel with the Ettan Spot Picker (GE Healthcare). Proteins in spots were identified by MALDI-TOF-MS-MS at the GIGA-Research Proteomic platform. Gels plugs were subjected to automatic tryptic digestion (PROTEINEER dp automated digester; Bruker Daltonics, Bremen, Germany). Gel pieces were washed three times in 50 mM NH4HCO3 followed by 50% ACN/50 mM NH4HCO3. Two other washes were carried out with 100% ACN to dehydrate the gels. In-gel digestion was performed with freshly activated trypsin (Roche, Basel, Switzerland) at a concentration of 10 ng l-1 in 50 mM NH4HCO3/5% ACN. After rehydration of the gel pieces at 8°C for 60 min, tryptic digestion was carried out at 30°C for 4 h. The resulting digested peptides were extracted with 1% trifluoroacetic acid (TFA) for 30 min at 20°C with occasional shaking. A volume of 3 μl of protein digests was adsorbed for 3 min on Prespotted AnchorChip plates with a-Cyano- 4-hydroxycinnamic acid (CHCA) as a matrix, using the PROTEINEER dp automat. Then the spots were briefly desalted with 10 mM dihydrogen ammonium phosphate in 0.1% TFA. MS fingerprints of the samples were acquired using the Ultraflex II MALDI-TOF–TOF mass spectrometer (Bruker Daltonics) in the mass range 700–3,500 Da. The Peptide Mass Fingerprinting (PMFs) was searched against the NCBI database. The variable and fixed modifications were methionine oxidation and cysteine carbamylation, respectively, with a maximum number of missed cleavages of 1. Mass precision tolerance error was set to 100 ppm. Peaks with the highest intensities, obtained in TOF/MS mode, were next analyzed by LIFT MS/MS. Proteins were identified with the Biotools 3.0 software (Bruker Daltonics) using the Mascot search engine (Matrix Science, Boston, MA, USA). Carbonyl assay was performed according to the procedure explained in the manual of protein carbonyl ELISA kit (Enzo® Life science catalog # ALX-850-312-KI01). Briefly, after extraction of total cellular proteins in extraction buffer (Tris 100 mM pH 7.4, 100 mM NaCl, 1 mM EDTA, 1% Triton X100, 0.5% Sodium Deoxycholate) by sonicator (50% power, 6 cycles, 5 min, on ice) and removal of DNA by streptomycin solution, the extracted proteins were reacted with Dinitrophenyl hydrazine (DNP); then the proteins were nonspecifically adsorbed to an ELISA plate. Unconjugated DNP and non-protein constituents were washed away. The adsorbed proteins were probed with biotinylated anti-DNP antibody followed by streptavidin-linked horseradish peroxidase. Adsorbances were related to a standard curve prepared with serum albumin containing increasing proportions of hypochlorous acid-oxidized proteins that has been calibrated colorimetrically. For detection and identification of carbonylated proteins in freeze-dried cells, a modified 2D-DiGE analysis (200 μg of one individual sample per gel together with 25 μg internal standard) was run, followed by western blotting. 2D-DiGE procedure was performed as mentioned in the previous section except that before running the second dimension, the IPG strips were incubated in a 10 mM 2,4-dinitrophenyl hydrazine (DNPH) solution for 20 min at 25°C. The IPG strips were then rinsed with Tris base/glycerol (2 M/30% (v/v)) solution and equilibration buffer. Each strip was then treated for reduction/alkylation and the second dimension of electrophoresis was run as mentioned above. Three gels prepared from each cell samples (nine gels for the three storage temperature) were transferred to activated PVDF membranes. Carbonyl groups in the transferred derivatized proteins were immunodetected with anti-2,4-DNP primary antibody (1/500) overnight at 4°C in skimmed milk-TTBs buffer. Then, the membranes were washed three times in TTBS buffer and incubated with the second antibody (1/2500) at room temperature for 1 h. Finally, after three washings with TBS buffer, the membranes were scanned with a Typhoon 9400 Laser Scanner (GE Healthcare) at three different wavelengths corresponding to the different CyDyes and Anti-DNP antibody. 2-D gel analysis software (DeCyder version 7.0; GE Healthcare) was used for spot detection, gel matching and spot quantification relative to the corresponding spot in the internal standard. Analysis of the fatty acid content was performed after trans-esterification of extracted fatty acid. Briefly, 100 mg of freeze-dried cells was suspended in 10 ml of 50 mM phosphate buffer (pH 6.8), mixed vigorously and incubated at 25°C for 10 min, and then the cells were washed twice with the same phosphate buffer solution. The washed cells were then mixed with 300 μl of a solution containing Chloroform/Methanol (2:1). After addition of glass beads to the cell suspension, the cells underwent three cycle of heat shock (Liquid nitrogen-37°C). They were then mixed vigorously for 10 min. The supernatant was mixed with 1 ml of methylation mixture (33% methanolic 3 N HCl, 67% methanol, 10 μg/ml BTH), and methylation was performed at 85°C for 35 min. After cooling of the samples, 900 μl of 0.9% NaCl solution was added to each sample, and finally the lipid phase was dissolved in Heptan. The gas chromatography analysis of the fatty acids contents was performed with a GC-2010 Shimadzu Gas chromatograph equipped with a SGE-capillary BPX70 column (30 m length). Supelco-FAME mix-37 (Sigma–Aldrich) was used as standard for fatty acids identifications and quantifications. All the experiments were performed at least in three independent replicates. Kolmogorov-Smirnov normality test was used for checking the normality of data. The test showed that in all the experiments, the data are approximately normally distributed. Two-Factors Repeated Measures ANOVA was performed on the data by R.3.0.10 Software. After doing ANOVA, we performed Duncan’s multiple range test (MRT) to investigate significant levels for the difference between any pair of means, regardless of whether a significant F resulted from ANOVA. The authors thank Dr. Sandra Ormenese and Mr. Raafat Stephan for their help, scientific and technical advice during flow-cytometric analyses. PL, is a Senior Research Associate at the National Fund for Scientific Research (FNRS), Belgium. This work was supported by Iranian Ministry of Science, Research and Technology (MSRT) and also by the Belgian Fund for Medical Scientific Research (FRSM). RS designed the experimental setup and carried out the fermentation, freeze-drying process, flow cytometry and proteomic analyses. RS also prepared the manuscript, figures and tables. RZ contributed in fermentation, ELISA analysis and helped in the revision of the manuscript. AB developed the protocol for Immunoblotting techniques. MB participated in the statistical analysis and interpretation of the data. PL supervised the proteomic analysis, and revised the manuscript. PT and FD supervised the whole work and revised the manuscript. All authors read and approved the final manuscript.